In response to today’s fast-paced, plugged-in world and highly polarized political climate, individuals from all backgrounds are seeking practical tools to help them live happier, healthier, and more fulfilling lives. Enter the revised and expanded second edition of the award-winning book The Heart and Science of Yoga, the American Meditation Institute’s Empowering Self-Care Program for a Happy, Healthy, Joyful Life. Written by renowned Yoga Science and meditation master Leonard Perlmutter, founder of The American Meditation Institute and one of the West’s foremost guides to understanding the nature of consciousness, this comprehensive guide shares Perlmutter’s extraordinary knowledge while gently leading readers to realize the profound wisdom and power they already possess. Both a record of Perlmutter’s personal journey and a transformational teaching tool, The Heart and Science of Yoga offers easy-to-learn meditations, prayers, stories from the world’s great spiritual traditions, breathing practices, a user’s guide for the mind, techniques for accessing intuitive wisdom, an introduction to ancient Ayurvedic health principles, and a holistic series of easy and gentle yoga exercises. The book also contains two new chapters of original material, including an introductory chapter that details how readers can change their perspective on any relationship and a comprehensive explanation of how to address the “gunas,” the internal weather patterns that cause emotional lethargy and restless activity but also yield evenness and composure. This revised edition also explains numerous yogic concepts through new, easy-to-understand illustrations. 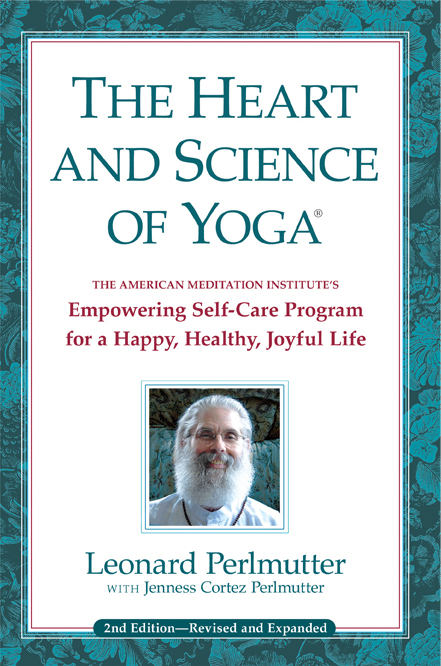 Accredited by The American Medical Association and American Nurses Association to provide continuing education credit for physicians and nurses, The Heart and Science of Yoga is the recipient of the following Book of the Year awards: ForeWord Magazine, Benjamin Franklin, Eric Hoffer, Nautilus, and Independent Publishers Association. Author: Leonard Perlmutter is the founder and director of The American Meditation Institute in Averill Park, NY, and the author of Transformation, the Journal of Meditation as Mind/Body Medicine. Over the past 40 years, Leonard has served on the faculties of the New England Institute of Ayurvedic Medicine in Boston, MA, and the International Himalayan Yoga Teachers Association in Calgary, Canada. He has studied in Rishikesh, India, and is a direct disciple of medical pioneer Swami Rama of the Himalayas. Mr. Perlmutter has presented informative workshops on the benefits of meditation and Yoga Science at numerous medical centers, universities, and prestigious forums. Leonard lives and teaches in Averill Park, NY.